The planet Mars has a major say in having a comfortable married life or not. Mars is called "Mangal" or "Kuja" in India in Hindi language. It is known to kill, separate or cause havoc in life. A favorable posited Mars is essential for Married life. The most dreaded concept of "Manglik" is known for conferring the results of early death of spouse or inharmonious relationship with the spouse.The most significant problem is that, a person with a Kuja Dosha will not feel much physical attraction to another with Kuja Dosha. A girl having a �Mangalik dosha� or �Vishakanya Yoga� present in her horoscope has a threat of becoming a widow. A �kumbha-Vivaha� is a must for such a girl.People of both sexes can be Manglik. If a boy having Mangal dosha is married to a girl having Mangal dosha then the malefic affects are nullified leading to prosperity and a happy married life.Manglik is a common word today. But who is Manglik astrologically or what is Manglik Dosha is not known to common man. Normally all believe in this myth. During matching of Horoscope of boy and girl before marriage people consult Pundits and Traditional Astrologer which result into rejection of most agreeable match of boy and girl and mental pain to love birds. Manglik Dosha is a main factor considered by them while doing Kundli Milan.This condition is astrologically believed to be devastating for marriage, causing discomfort and tension in relationship, leading to separation and divorce, and in some cases, it is believed to cause untimely death of one spouse. This is attributed to the "fiery" nature of this planet. Find Weather You Have Mangalik Dosh? It is a 3 days long Puja.In this special 125000 Jap of Mangal Puja Package the Mangal Pujan and Homam will be performed and its Prasadam will be shipped along with Siddha Mangal Yantra and Puja DVD .This Puja is Vediographed.Total cost of this package is 300$,all inclusive,i.e. Shipping etc. all complete. 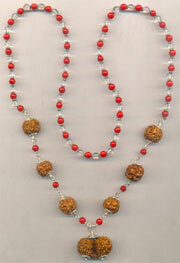 Gauri Shankar in the centre ,Three Mukhi Rudraksha (6) , Red Coral Beads.